Becca is grieving the death of her best and only friend, Charlotte. She spends every minute she can with her head buried in a book, avoiding the world, her grief, and making connections with people. She is socially awkward and thinks people don't notice her. But they do. When Becca face plants into Max's lap in class, and after a little pursuing from Max, they become friends and Becca starts to come out of her shell. She signs up for the school play and starts to live. Charlotte's death and grief hang heavily over Becca as happiness in her new life wars with guilt over moving on. The lovely teen romance between Max and Becca moves slowly and is PG rated. Becca's relationship with Max is important in her new life, but so are the people around her. Max's best mate, Victor, provides comic relief while frienemy, Darby, helps hold a mirror up to Becca's life, forcing her to face things she'd rather avoid. This is a beautiful story about a girl learning to move out of her comfort zone and live life after the death of a loved one. I note this is a companion book to Love and Other Unknown Variables but I read it as a standalone. Love and Other Unknown Variables has been added to my 'to read' list but knowing what I know, I'm not sure if my heart can take reading Charlie's story. Perhaps I need to take a leaf out of Becca's book and move out of my own comfort zone. Shannon Alexander was compelled to write this story after the death of her best friend to ovarian cancer. She is a member of SCBWI and She Writes, and works as a copy editor for Sucker Literary, a showcase for new and undiscovered writers of young adult literature. She recently completed her seventh Susan G. Komen 3-Day for the Cure in Washington D.C., and is an active supporter of cancer research. 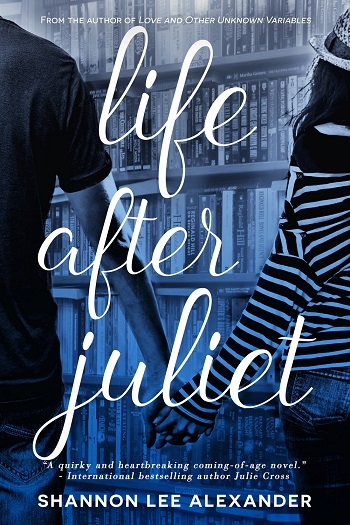 Reviewers on the Wicked Reads Review Team were provided a free copy of Life After Juliet by Shannon Lee Alexander to read and review.